In this field of moral philosophy, warfare and the new forms of confrontations are endless topics. The use of drones and robots on the battlefield, the changes in the way we approach defense issues, the evolution in the sociology of the military are some of the most thrilling subjects to address. Besides, moral philosophy applied to political science opens doors to an infinite number of perspectives and offers an undreamt playground to free spirits. My understanding of the world switched from a very static perspective in which facts were given as truth, certainly due to my military experience, to a much more flexible perception. Two things heavily influenced my thinking: first comes ethics which I learned about while a student at Science Po. Ariel Colonomos, who would later become my PhD supervisor, was giving a seminar on Ethics in International Relations. He made me discover the depth of philosophy and the incredible vastness of the field when applied to IR. I have then been given new perspectives, new potentialities, the inestimable possibility to learn that there was something outside of the box. It has been both an exciting and disturbing revelation. There was something outside of the shrank scope of my thoughts, out of my small intellectual box. Constructivism has been the second element shifting my thinking. I actually discovered this approach through philosophy while reading intersubjectivists’ works such as those of Kant, Arendt, Levinas, and Honneth. I then discovered Schopenhauer’s book The World as Will and Representation, then, in sociology, the work made by Berger and Luckman about The Social Construction of Reality, and later, in political science, March and Olsen’s “Logic of Appropriateness”. When used with the three levels of analysis in IR (individual, State, and structure) it offers incredible insights about the way perceptions are shaped and institutionalized, and how these perceptions, or misperceptions, influence action. It is much more profound and complex than traditional IR theories with their a priori and reifications. Thus, instead of using theories to understand the world as I did in the very beginning of my journey in the academic world, I now far prefer trying to understand the processes at work through the constructivist perspective. If drone warfare begins to be extensively used by other countries, do you think it will impact the debate in the United States? I would say it is already the case. Around 80 countries in the world possess drones. It obviously has an impact on the use of these systems by the United States. The debate regarding the massive use of drones by the Obama’s administration cannot be disconnected from the environment in which it takes places. If drones are used more and more, people will be more and more familiarized with these systems, they will be less inclined to question their utilization. It is an ongoing process: drones are no longer unknown objects that cause suspicion. Besides, the generalization of the use drones implicitly legitimizes them as a tool for foreign policy. How would you describe the U.S. drone program? Do you think it is effective? Ethical? I would say that it is both a realist and a structuralist program. Realist in the sense that it has been set up to respond militarily to contemporary threats, trying to gain advantage upon opponents of the United States. Structuralist to the extent that this program lies upon a strong belief that structures strategic thinking, and that Professor René Moelker from the Netherlands Defense Academy calls the “paradigm of control”, meaning the idea that our environment can be controlled thanks to technology. This belief is deeply anchored in the minds of political and military leaders, especially when it comes to making decision in international politics. Besides, this over-reliance on technology led to the development of stand-off weaponries, allegedly able to strike with a surgical precision, and consequently withdrawing casualties from the equation. Strong expectations were born from the prospect of ‘zero-dead’ or ‘riskless warfare’ brought to light by the so-called ‘Revolution in Military Affairs’. People are now expecting, because they have been told that it was possible, wars waged from a distance allowing zero losses in their own forces and zero incidental losses on the other side. Obviously things are not that easy. Technology is not the solution to all evils, neither is military force. The realist and structuralist tropisms are not helping to think outside of the box and to find relevant and innovative solutions to address contemporary issues. However, it is hard to assert strongly that the drone program is either effective or not. It is hard to measure the effectiveness of such a strategy. Some short-term objectives can be reached through this program, but that does not mean that final ones, if any, will be. Regarding the erroneously called “war on terror”, some battles have been won, but the so-called “war” itself is not, and will certainly not be. There is no possible “victory” possible against terrorism, at least not in the traditional sense of the word. Concerning the ethicality of the American drone program, there is no easy answer. Without diving deep into philosophy, I would argue that it depends on the adopted perspective, which means that it is highly subjective. From the side of those who suffer from this program there is legitimately something unethical in the use of these systems which does not allow targets to prepare themselves for combat and creates a strong asymmetry. On the other side, from the perspective of those who use them, it is ethical since it allows the US to insure its security and advance its national interests. I would even suggest that the use of drones is not less ethical than the use of improvised explosive devices or suicide bombing. My opinion on this is that ethics is not a relevant tool to assess objectively the use of drones – international law is. Any kind of means used in a conflict and that results in people being injured or killed would fall into that intractable ethical question. How can supreme sacrifice in the military be articulated to modern forms of warfare characterized by a growing distance between combatants? It is often forgotten that the evolution of warfare irremediably leads to an evolution in mentalities. The use of new technologies has a strong impact on the ideas related to what is war and how it should be waged. The development of drones and robots already has an impact on the sociology of the military. Supreme sacrifice is at the core of the profession of arms. It refers to the very identity and role of military members. This identity is deeply rooted in the history of warfare which makes military members warriors before anything else. Their role stems from this identity: warriors are expected to fight, risking their lives, for the community they belong to. Besides, the warrior’s identity is based on the traditional perception of the soldier facing death without trembling. Courage is certainly the most important virtue in the military. And courage goes hand in hand with fear. This means that military members are warriors defending their country mastering the fear of death. The myth of close combat is significant here. Thus, if you remove combatants from the risk zone, fear will at least lower, if not disappear, courage will no longer be a necessary virtue, and military members will be deprived of the very essence of their identity. Supreme sacrifice is a myth that has been built for centuries based on the assumption that people should accept death to defend a transcendent object (a Nation, a King, a God). If you bring tools that withdraw this need from the equation, you withdraw incentives for supreme sacrifice at the same time. This is particularly true where the transcendent object is fading, like in France where the idea of Nation has lost its meaning and is, for many people, no longer something considered as worth dying for. Do you think that the convenience of drone warfare risks dragging the U.S. into conflicts it could otherwise avoid? This is a pretty common assumption. Drone warfare is supposed to lead to a lowering of the threshold of entry into war. I must say that I am skeptical about that. I do think that if a state wants to wage a war, whatever the means at its disposal, it will do so. Drones make things easier obviously. Special operations as well! Private contractors too! In their time crossbows, muskets, tanks, or fighter jets also made things easier. Did that lead state to recourse to war more easily? I strongly believe that war is a matter of cost-benefit calculus, even if the calculus is not always correctly made, or even if it sometimes proves wrong. The United States will legitimately wage any war it considers possible to wage and relevant for its security. This will be done whatever the tools they possess. What is the impact of remotely piloted systems on the value systems of the military? The most important impact is on the virtues that are at the core of the military such as courage or honor. These virtues are the product of centuries of history and are nowadays profoundly integrated in the identity and role of military members. There are many debates surrounding warfare waged from a distance, some, like Professor Robert Sparrow from Monash University in Melbourne, Australia, wondering if wars can be waged without virtue. There is an exciting book written by Victor Davis Hanson, The Western Way of War, in which the author demonstrates how Western military forces are stuck in the idealistic model of the hoplite and the phalanx. If you look deeper into this model, you will clearly see that in the military, this heroic model of hand-to-hand combat is still highly valued. I have clearly seen that during my twenty-two years in the French forces. The issue is that this historical structuralism does not allow to think objectively new forms of confrontations. In the military things are still considered through the prism of traditional war. Obviously strategy follows and as one can notice, this hardly if ever works. Then, remotely piloted systems rattle military convictions concerning what it means to be a soldier, taking risk, facing death, combating with due respect for your enemy, and war conventions. The very sense of the profession is becoming blurred, and the value systems does not seem as relevant as it previously was. How is remote warfare influencing the way we understand modern confrontations? So far I would argue that it has only marginally influenced our perceptions of modern confrontations. Once again, we are still prisoners of our intellectual box made of war, victory, values, and the use of force. This is not evenly true in all Western countries. However, the trend is to think of newness with old tools. This leads to what I call the “copy-paste syndrome” which consists of finding solutions to contemporary issues in past situations presenting similarities. This is a heuristic approach. We used it in Afghanistan and we failed. We tried to find solutions to this conflict in the Algerian one fought by France. In the US, officers were asked to read French officer David Galula’s work on counterinsurgency in Algeria, and to watch Gillo Pontecorvo’s movie, The Battle of Algiers, before being deployed in Afghanistan. It inevitably led to a strong misunderstanding of this specific confrontation and a lack of deductive reasoning based on the situation over there. Meanwhile, we witnessed an extensive use of drones. But, the big picture, meaning the very idea that we were fighting a “war” against terrorism, shaped the perceptions of the Western world, and people in many countries considered that killing from a distance did not fit with their understanding of war. Many people still consider that it is unethical regarding traditional standards. This demonstrates our inability to think outside of the box. Is supreme sacrifice, which remains at the core of the profession of arms, still relevant in confrontations against terrorist groups such as Daesh? I do not think so. Supreme sacrifice is a myth rooted in ancient history when soldiers had to risk their life in close combat. Besides, it has been built on the premises of a gentlemen agreements between combatants which gave sense to this cruel and organized game that is traditional war. Supreme sacrifice falls within the framework of the existence of a transcendent object being worth dying for. In our modern societies, when it comes to war, this object is the nation-state. When you are in the military you are expected to accept to give up what is your most valuable good, i.e. your life, for the sake of the homeland. This results in two issues. First, this transcendent object must be considered as above any consideration regarding one’s own life. In France, this is no longer the case. The nation-state is no longer this deity entitled to request sacrifice for its survival. Second, regarding the fight against terrorist groups such as Daesh, the threat against the survival of the state is not as clear as in traditional threats coming from other states. Then, leaders have to make considerable efforts, that too often turn into some kind of propaganda, to convince military members that fighting terrorism is a matter of life and death for the country. This why this kind of fight is misleadingly presented as a war, for war implicitly refers to familiar understandings regarding threats against the homeland. Finally, I would suggest that sacrifice is even less relevant that military means are not the solution to fight against terrorism, at least not in the constrained way we use them. This is the very point where drones operated by civilians are valuable tools. How do you think the U.S. drone policy has impacted the country’s foreign policy? The U.S. drone policy had impacted its foreign policy in many ways. Mostly, it has thrown a veil of suspicion on the morality of U.S. foreign policy. The image of the country, which is paramount in IR, has been spoiled. This is especially true as the U.S. has developed a strong speech around its values and the defense of a certain kind of morality. The gap is so flagrant between speeches and acts that it is now striking for any observer of the international scene. It must be stressed that it is not specific to the U.S.. I would even say that France with its strong interventionism faces the same situation. Obviously, this leads to a deep mistrust towards the U.S., and fosters the security dilemma. I think that the realist approach of IR implemented by the U.S. favors the perception of insecurity, and nourishes the hatred some actors of IR feel towards the U.S.. It has also made U.S foreign policy less transparent. The use of drones, and it is clearly one of their many advantages, is that they are less visible than deploying military means like sending boots on the ground. This lack of transparency is also very noticeable in the way the U.S. by-passes international laws. The violation of certain states’ sovereignty is one example. Finally, I would say that it has an influence on the U.S. feeling of accountability toward the international community. Since the drone policy is less open, the U.S. feels less accountable. I would add that this lowering of accountability is also at work at the domestic level. 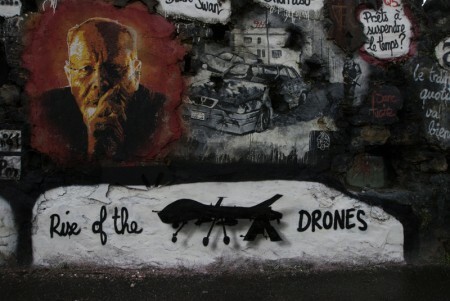 The use of drones, by whatever country is concerned, entails the sidelining of the people. This is problematic to the extent that the foreign policy of democratic countries is tightly linked to the people who are supposed to have a say in the decisions made by its leaders. Lack of transparency results in putting the people aside, and ends in the lowering of accountability. First: think outside of the box. It is the most important advice I usually give to my students. Never reject any possibility from the beginning, even the craziest, or the most unacceptable. Put all the options on the table and then study them thoroughly, honestly, putting aside your a priori. Axiological neutrality is essential for scholars. We are not all equally capable of that. But at least we must try. Then, to think differently, young scholars must also be curious, not only in their field of studies but in every domain. This is the only way to make connections between things that seem most of the time perfectly disconnected at first sight. If you are able to make new connections, to mobilize knowledge from several fields, you will think newness. Finally, I would recommend that young scholars read Nietzsche’s work, especially Beyond Good and Evil, when he addresses the “free spirit”. This would be my last advice: free yourself from the mainstream. Think by yourself, go beyond historical structuralism, and broaden the limits of your inner intellectual box. Emmanuel R. Goffi is a specialist in military ethics and security studies. He is currently a research fellow with the Centre for Defence and Security Studies at the University of Manitoba (UofM), in Winnipeg, Canada, and has been an officer of the French Air Force (captain) for 22 years.